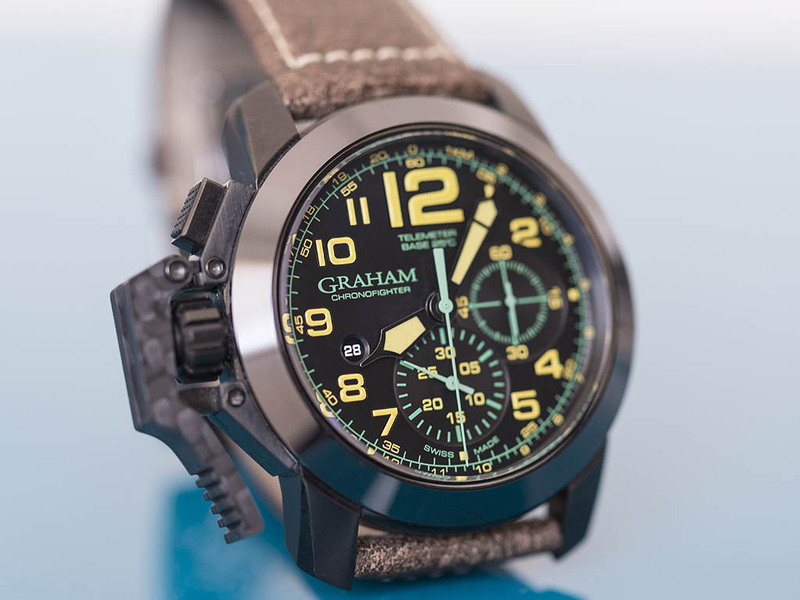 Graham is a relatively young brand. 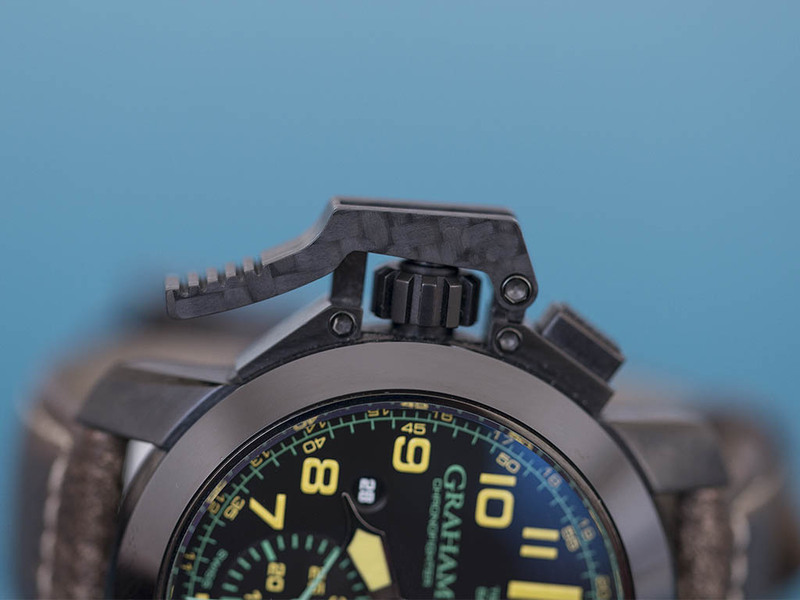 As mentioned before in our previous news section with it's brief history the unique chronograph pusher ( better to call it lever.. ) is almost the trade mark for Graham. With it's bold designs and characteristic pattens Graham's place among other brands became solid and stable. Well, I can say that I know Graham but, obviously not like I know Rolex. I know the brand and I respect their design and craftsmanship. 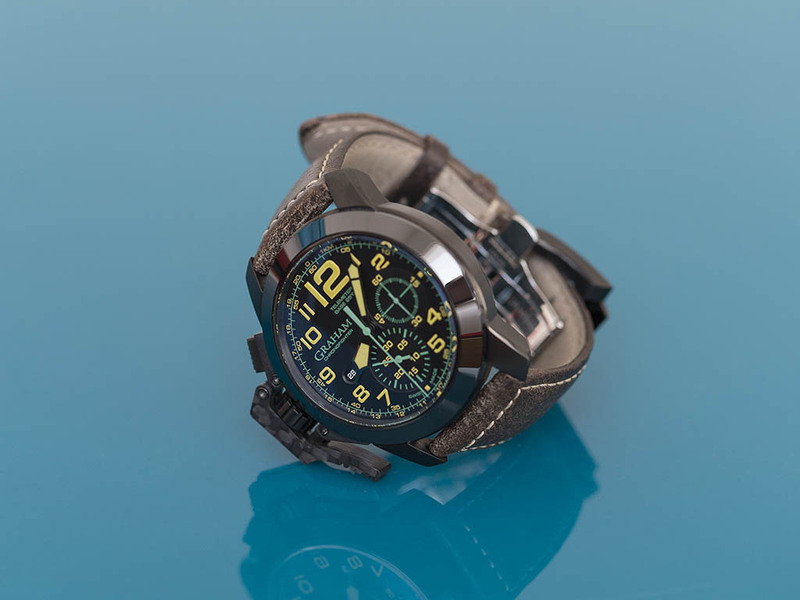 When I saw this beautiful example of Chronofighter's re-newed product line I thought I gotta take it for a test drive. First of all almost every metal part of the watch is coated in black PVD. 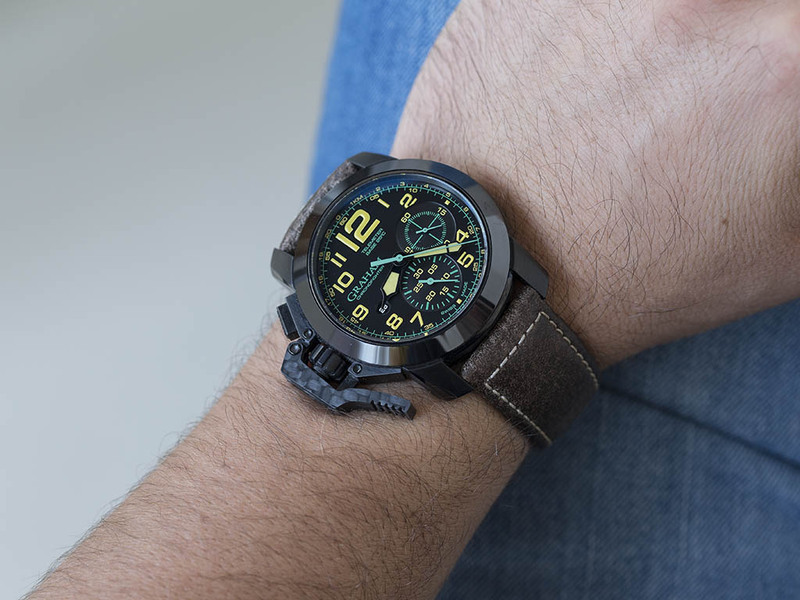 Considering my past experience with the black PVD Swordfish, I'd be feeling better to see the watch is coated with DLC method which proved to be more scratch resistant than regular PVD. Chronofighter II deserves to be called oversized with it's 47mm diameter case. Though the watch looks a bit smaller than 47mm thanks to it's black theme, it's still a big one. 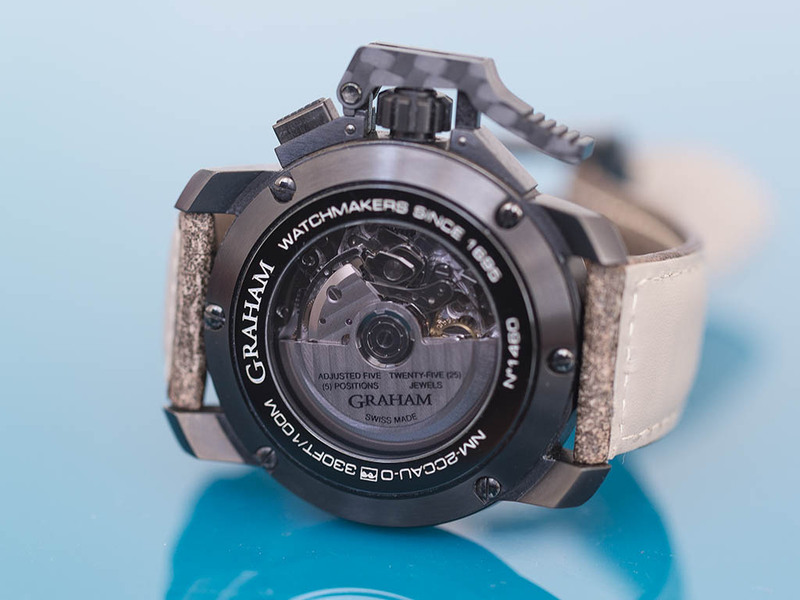 Graham makes me smile this time with it's bezel made in hard ceramic which makes virtually scratch proof. The watch's beautiful dial features a great contrast with yellow accents over matt black. Due to it's crown and pushers located leftside of the watch, Oversize II houses an up side down version of Valjoux 775X to beat. The dial lay out is designed in two sub dials form. I'd call it a Bi-Compax but, since the sub dials are not in line with each other I'd prefer to call it two sub dials. I noticed an indication on the dial saying “ TELEMETER “. Briefly Telemeter function allows you to calculate the distance between you and the source of the sound you heard using the chronograph function. Personally speaking, it's use is limited to a dial indication only. It's easy to read the time almost at every angle thanks to the great contrast and perfecetly designed dial prints. 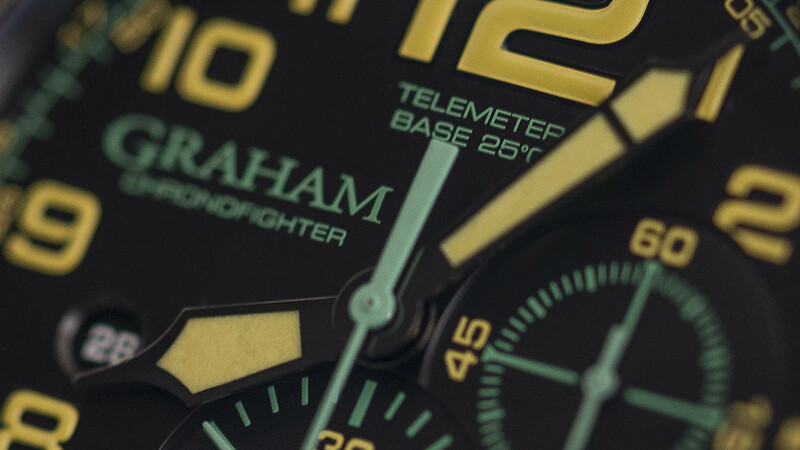 I sincerly thank Graham for chosing black ( blends in the black dial perfectly ) for background of date disk which helps to keep the dial's balanced design. 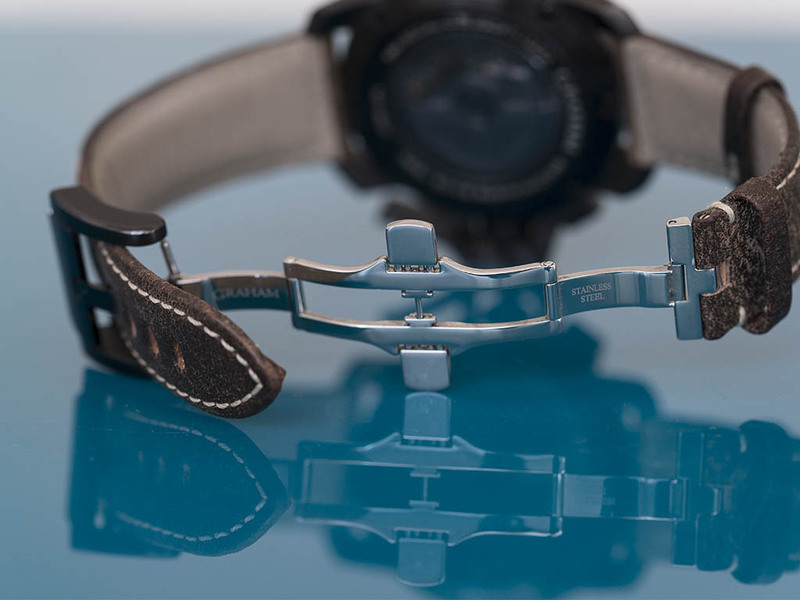 The most important upgrade is the re-newed chronograph lever. Being designed in a more compact manner, the lever's material is also manufactured in forged carbon. The details on the lever are stunning. The natural form of forged carbon gives the watch a more tactical look. The new lever also feels more comfortable compared to it's wrist digger predecessor. The crown securely located within the lever feels solid. The reset button which also offers practical use is located at 10 o'clock position. The case back is black PVD coated. While I could not stop thinking that stainless steel ( or titanium..? ) would have been better since the case back is far more prone to coating failures than any other part of the watch due to permanent skin contact, I must say I loved the slightly smoked sapphire at the back. I have seen lots of early generation Grahams missing the embossed British Navy symbol at the case back. 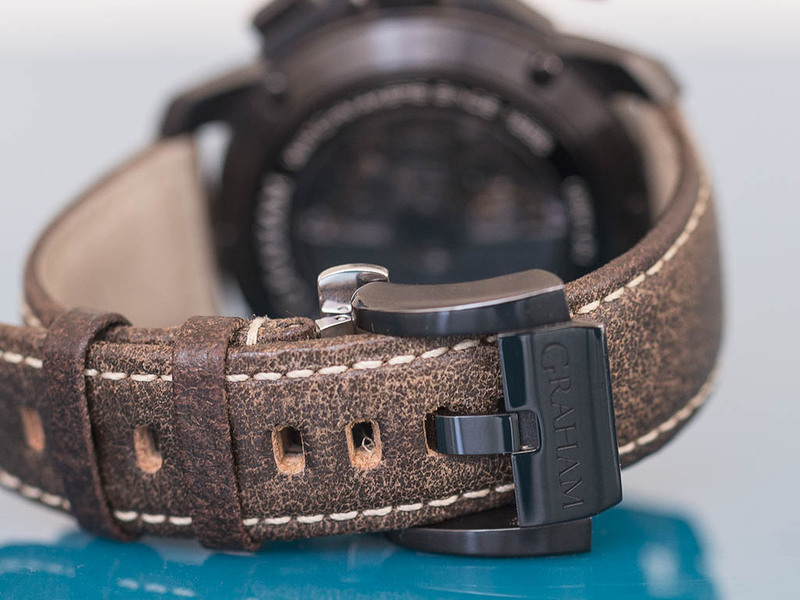 The watch comes on a very nice, WWII Bomber Jacket leather type brown strap. The folding clasp's buckle is also black. Oversize II features a ETA Valjoux 7750 based caliber Ref. G1747. It's easy to spot it's Valjoux roots thanks to it's wobbling rotor. Watch sits quite comfortably on my wrist. I enjoyed wearing the watch as it's nicely balanced with it's relatively short lugs and re-designed chronograph lever . I really like the leather strap which reminds me my Avirex G-1 Bomber Jacket. When the subject is Graham it's hard to give advice. Forget about the 47mm diameter for a second, the design itself is really on the bold side. 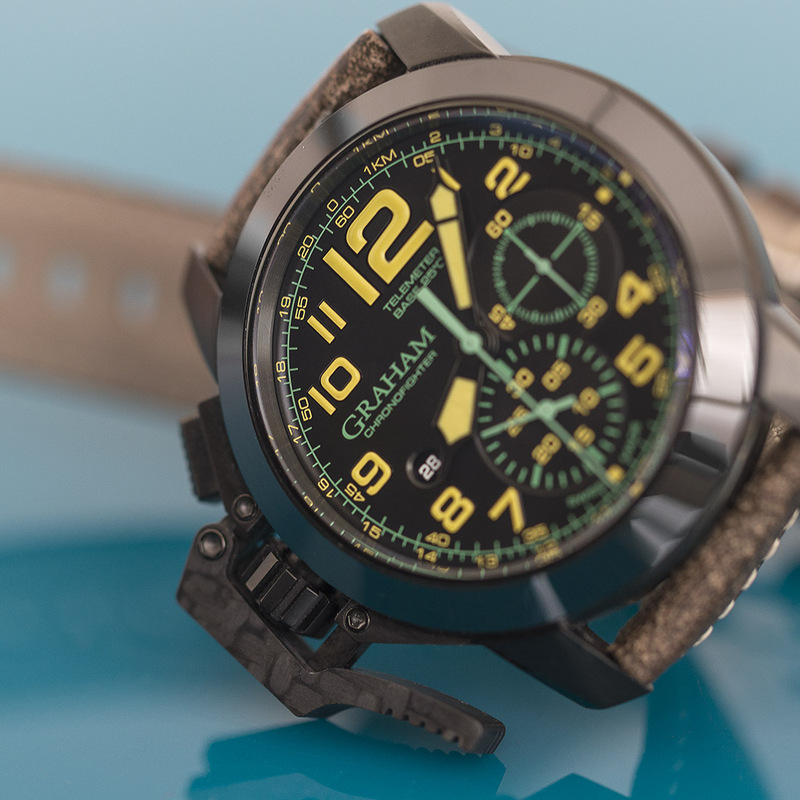 I know it sounds cliche but it definetly fits the case here; If you like big watches with bold designs which are hard to see on an average person, Graham Oversize II will surely fit your style.